Okay, I have a confession to make. I know I've mentioned before that I'm not a fan of how people react when they see someone with a disability. They tend to either stare openly or try to take a discreet peek at what exactly makes the other person so different. And of course, they look very uncomfortable. Like I've said, those kinds of things annoy me. But here's what I've figured out quite recently: I am one of those people. Yes, I admit it. I get all awkward when encountering another person with a disability. I guess I've always known this, but the moment that it became really clear to me occurred a couple days ago. I was waiting for my bus when a man in a wheelchair made his way across the sidewalk in front of me. It was one of those cool motorized wheelchairs so, needless to say, he looked pretty badass. For some reason, though, he made me very nervous. I was so afraid to even look his way because I knew that he would (not incorrectly) assume that I was staring at him because he was in a wheelchair. As a disabled person myself, I know firsthand (haha, it's a pun!) how annoying people's rude stares can be. So I'd hate to subject someone else to something I don't want done to me. That's sort of hypocritical. Still, it's hard NOT to look. I'm not used to seeing others who are so different. That's the thing about obvious disabilities - they're different. And different equals interesting. People are naturally drawn to things that are unconventional and/or strange. That's why celebrities all try to outdo each other in weirdness. It's the reason why Lady Gaga wore a meat dress and Katy Perry dyed her hair pink. Being different draws attention. And that's not necessarily a bad thing. 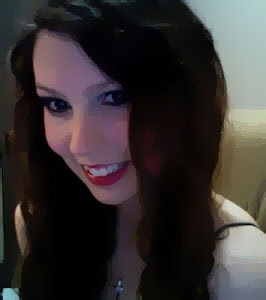 Sure, the stares can be obnoxious sometimes, especially when I just feel like blending in with the rest of the world. But I find comfort in knowing that Lady Gaga would kill to be part-bionic like me. 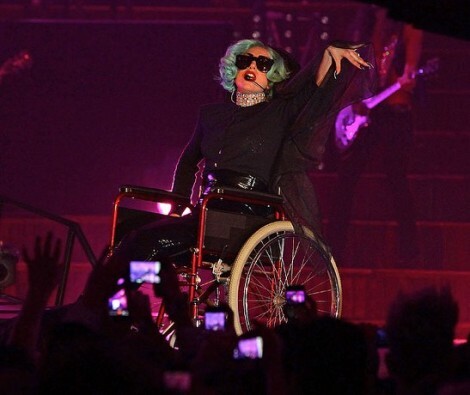 After all, she's already performed on crutches and in a wheelchair. I mean, I consider that a compliment! So, to the man with the cool wheelchair who caught me looking, I'm sorry if it made you uncomfortable. But I really hope that one day, you too will take it as a compliment. "Honestly, it made me want to be friends with you. First, this is just because it instantly made you more interesting than anyone else in the room. And second, I think that we all have some issue or another, but for those of us whose issues aren't visible, they are easier to bury, hide or ignore. (I'm NOT trying to down play what you've been through in life AT ALL) But when your "issue" is visible, it almost forces you to confront it, deal with it, and learn from it. And, in my experience, these types of people are much more rounded and interesting, and I often feel drawn to them." So, I think you're onto something!